Hola! This is one of the item from my Watsons Haul. So I've tried this product for a few days now, and I have to admit that I'm liking it. As the product states, the Biore UV provides long lasting protecting from harmful UV rays that causes darkening, formation of spots and freckles. It is also an effective make-up base, and contains sebum absorbing powder to prevent oily and sticky skin, can be used as make up primer. Unlike foundation, it does not clog pores and it is unscented. The texture of this product is literally like milk. It is in a liquid form, the moment you squeeze the lotion out it looks like milk! As I apply on my skin and spread them out, I noticed that the texture felt like liquid then slowly it felt "powderish". 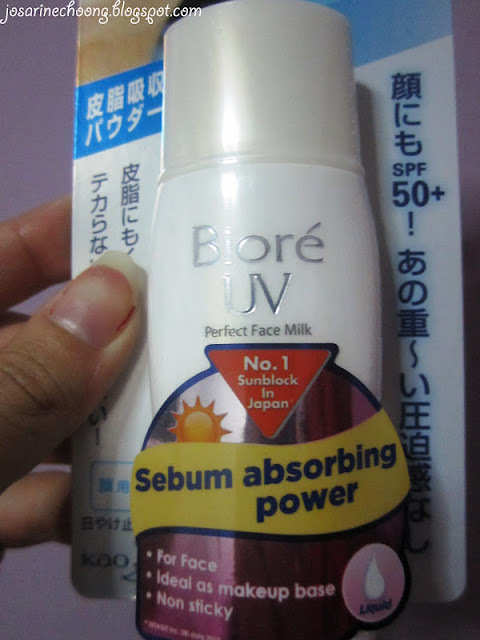 Throughout the day, I noticed that my face does feel less oily as compared to when I didn't apply the Biore UV. I have to admit I really like this product. 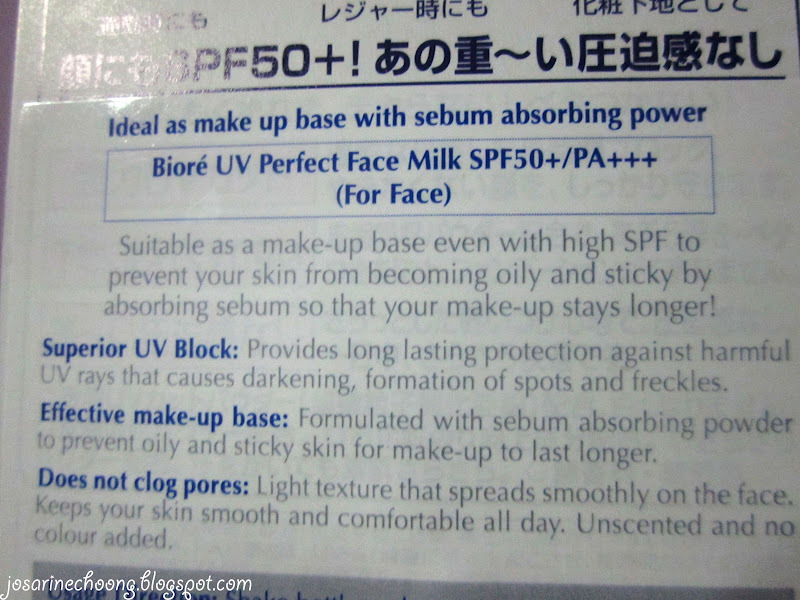 However, I have to apply moisturizer before I apply the Biore, if not my face would be very dry. So for those with Dry Skin, you need to apply your usual daily moisturizer before you apply the Biore UV. But if your skin is very dry, and you need really strong face moisturizers, then this product is not for you. I think they have a range for Moisturizing, saw it on the magazine, but did not see it at Watsons when I was there the other day. great review. hopefully it works on my skin. Hi Jenny, Im not sure but i think it is available in philipines. I read it somewhere. Do check at the pharmacies or drug stores at your area. If not check this link out. Do you think it’s good for oily skin? Hi Pauline, yeap it is. I have oily skin and this actually helps with oil control a little and can be used as a face primer as well.